A place for e-learning pioneers and leaders in the North-West metro region of Melbourne, Victoria (ACFE / LearnLocal projects). Share information, publicise, reflect and connect. #1) Live session / workshop - a North West Cafe webinar. One of the simplest ways to get people talking on the web: we're running a session introducing newcomers to iPadio (phone blogging). Because people have such complicated lives, we're running it twice. And we're offering this out to the other regions, so we need to have your RSVP. 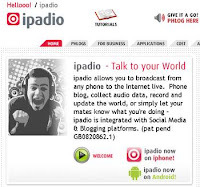 A hands-on tutorial in making a phone blog using ipadio. For people with absolutely no experience in this wonderfully easy podcasting tool. For e-leaders in the current e-mentors program plus anyone else with curiosity and a sense of adventure. People with experience are welcome to attend too. We hope to have some time to discuss your thoughts on the applications of this tool for teaching and learning. There might be an opportunity in a few months for a Phone blogging How-to webinar Part 2 - on customising the podcast details, embedding the podcast and registering for your own account/ channel. Stay tuned, because this is the first of a whole series of online professional development for e-learning practitioners across the regions. This means sessions delivered not only by Jill, Ann & Michael in the North-West, but also many more amazing e-learning people right around Victoria. The workshop worked really well - we tested out the ipadio phone blogging software by having three people simultaneously posting a phone blog at the same ipadio channel. I'm not sure what the 'carrying' capacity of the ipadio system is, but it all worked smoothly - maybe we should test its limits by having 50 people all doing it at the same time! Nevertheless our participants found the technology easy to pick up and they had all finished well within the 6 minutes allocated to the task. With a web tour of the North West ipadio channel, we could immediately view and listen to the 'vodcasts'. We noted the relative clarity of audio quality considering that we were replaying the recordings through the web conferencing room. I undertook to give this very positive feedback to the ipadio crew: they are always very accommodating and responsive to questions raised, and are very interested in how teachers are using the software in learning settings. Phone interviews are nice, as you get two or more voices speaking in conversation – perhaps a more natural means of communication than just one person speaking into a phone. You've got a good point there, Frankie. I'm not sure how to conduct a phone interview using ipadio unless you set the phone to external mic and sit together. However, the sound quality diminishes significantly when you phone blog using the external mic. You could always use an mp3 player/recorder to record the conversation/ interview and then upload the mp3 file to your ipadio channel.